This multi-purpose Spa Chair/ facial bed is a must have. Newly designed with sturdy double support brackets and upholstered with comfortable and easy-to-clean PVC leather. Features a removable face cut-out pillow and fully removable armrests (without screws or nuts), also adjustable head, back and leg rest. Whether you're using it for facials, eyebrow threading, tattooing or teeth whitening this versatile equipment will get the job done. • Includes MATCHING HYDRAULIC STOOL! • Arm to Arm (Inside): 20"
• Arm to Arm (Outside): 28.5"
• Height Adjustment: 18" - 23.5"
This sleek multi-purpose facial bed is equipped with hydraulics, not only can the height be adjusted, but it also swivels 360 degrees. Newly designed with sturdy double support brackets and adjustable head, back, and leg rest. Whether you're using it for facials, eyebrow threading, tattooing or teeth whitening this versatile equipment will get the job done. 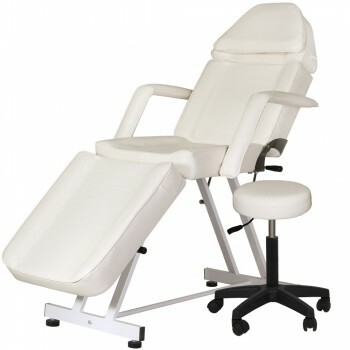 • Arm to Arm (Inside): 21"
• Height Adjustment: 27" - 33.5"
With newly designed sturdy base and pump, this heavy duty hydraulic facial bed has great features. 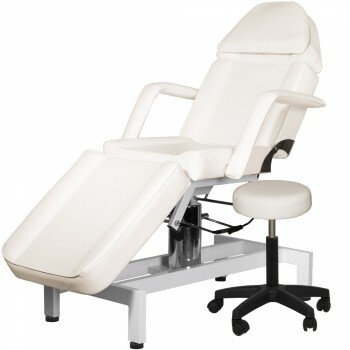 Facial bed has thick foam seat, foot, and back rest cushions covered with an easy-to-maintain, durable, and comfortable PVC leather. 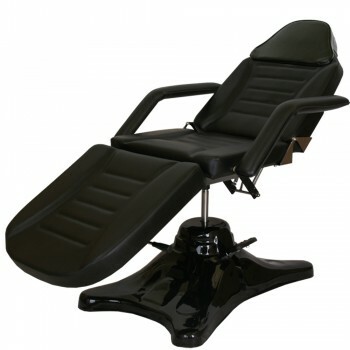 This facial bed can accommodate up to 450 lbs, swivel 360 degrees, and can be adjusted to your desired height. Ideal for skincare, eyebrow threading, massage, tattooing, or teeth whitening. This equipment is what you've been looking for. • Arm to Arm (Inside): 24"
• Arm to Arm (Outside): 30.5"
• Height Adjustment: 21" - 26"